Does Your Company Work Out Loud? Dr. Dennis Pearce, Enterprise Knowledge Architect at Lexmark International, Inc. will be speaking at the KMWorld conference in Washington DC. His session is B105: “Working Out Loud” (WOL): Perspectives Panel. Click here to register. Doesn’t it seem a strange paradox that ever since the advent of social media, many of us have become increasingly comfortable with the notion of sharing our most intimate (and often mundane) personal activities with the entire world, yet on the other hand we struggle with or even actively resist efforts to share knowledge of our daily work with our own co-workers, knowledge that many times is actually the property of our employer? This definition highlights the fact that sometimes working out loud can be a team activity within the flow of work and sometimes an individual activity above the flow. As a team, we might create a project space on an open enterprise social platform. We might also conduct our electronic conversations via discussion threads rather than emails. As an individual, I might share what I’m thinking or working on by blogging, tweeting, or posting a status update. In both cases, the key point is that the work being done is available for review or comment by others who are not necessarily part of the intended audience. This creates benefits at three different levels. Individuals benefit in several ways. They build their social networks within the organization as they get discovered by others with similar interests. They gain peer recognition for their ideas and work, and they can save themselves major time, effort, and embarrassment if mistakes in their thinking are caught before they can progress to action. When groups and teams work out loud, they amplify that work. For example, a team working out loud in a large organization might be discovered by another team in another location doing similar work, allowing them to pool their knowledge and resources. The organization benefits in many interesting ways as the number of employees working out loud reaches a critical mass. Knowledge is produced and stored as a byproduct of work rather than as a goal, and thus becomes a utility in the sense that it is “always on” and available without the need to be pushed or pulled. Knowledge can be transferred via ambient awareness, fueling innovation. Internal business processes become self-documenting when the entire history of their development is available for review. We are presently at a crossroads of organizational design as companies search for ways to be less hierarchical and more adaptive and responsive to rapid change. The organization of the future is often described variously as fractal, complex adaptive, autopoietic, “teal,” a holarchy, wirearchy, or holocracy, all implying that information flow and decision-making occur organically rather than hierarchically. 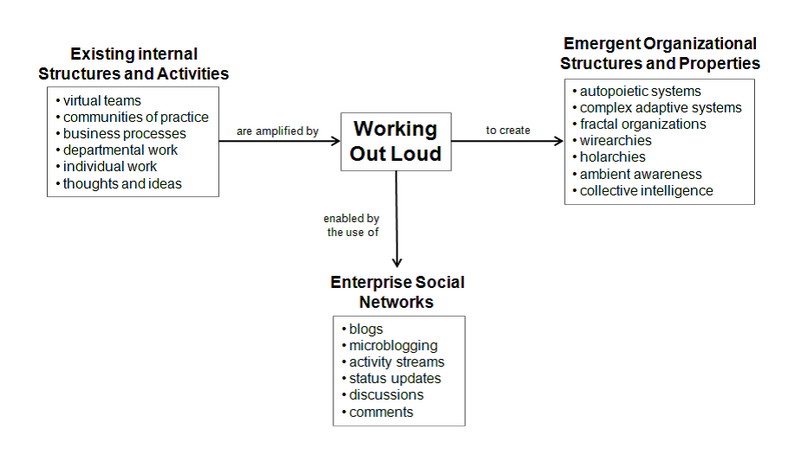 As today’s organizations strive to become more networked, working out loud becomes an essential behavior that helps facilitate the “massively parallel” flow of information and knowledge in all directions that will be required to produce collaboration and communication paths that are emergent rather than designed top-down. The two biggest challenges facing organizations who want to work out loud are (1) getting their employees to change behavior and (2) measuring the results of their efforts to create this change. I won’t spend time on the first challenge here but instead refer you to the excellent book Working Out Loud by John Stepper, who shares a process he developed and refined at Deutsche Bank that helps employees overcome many of the inhibitions that hinder their ability to work in this new way. My focus over the last two years as my doctoral dissertation has been to develop a simple survey for measuring working out loud at an organizational level. Knowing how employees in large organizations often suffer from “survey burn-out,” the goal was to create a survey with the minimum number of questions that would still provide a numerical measure that could be tracked over time and correlated with other measures such as employee engagement or financial metrics. It turns out that two sets of three questions each are all that are needed to create indexes for individual and group working out loud (responses are on a 1 to 7 scale). When I work on a team, we share the team’s goals in a way that those in other parts of the organization can see. When I work on a team, we communicate with each other in a way that those in other parts of the organization can see. When I work on a team, we make our work visible to the larger organization before it is complete. I share my thoughts and ideas on <enterprise social platform> with others beyond my immediate co-workers. I share difficult work-related problems on <enterprise social platform> with others beyond my immediate co-workers. I participate on <enterprise social platform> by doing things such as starting discussions, making comments, creating status updates and blog posts. I would love to hear from anyone who decides to use this survey in their organization. With enough data, it would be interesting to see if any patterns emerge across companies or industries. Finally, I would be remiss if I did not mention that International Working Out Loud Week is coming up November 16-23, just two weeks after KMWorld. Visit the web site, follow the action on Twitter with hashtags #wol and #wolweek, but most importantly of all … join us in working out loud!